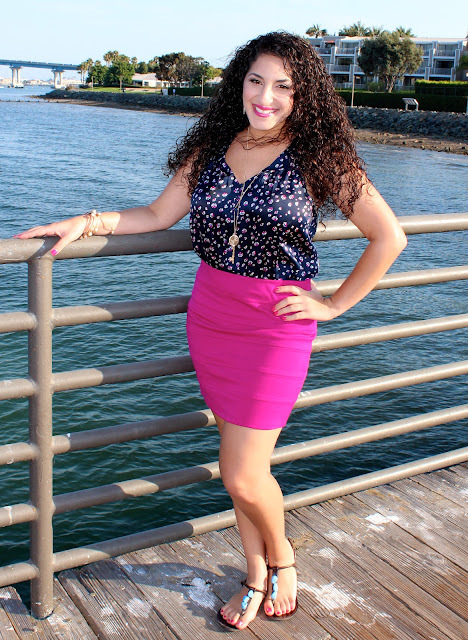 While on vacation in San Diego, I wore this navy floral blouse tucked into a magenta bandage skirt while hanging out at Coronado Island and for dinner later that evening. 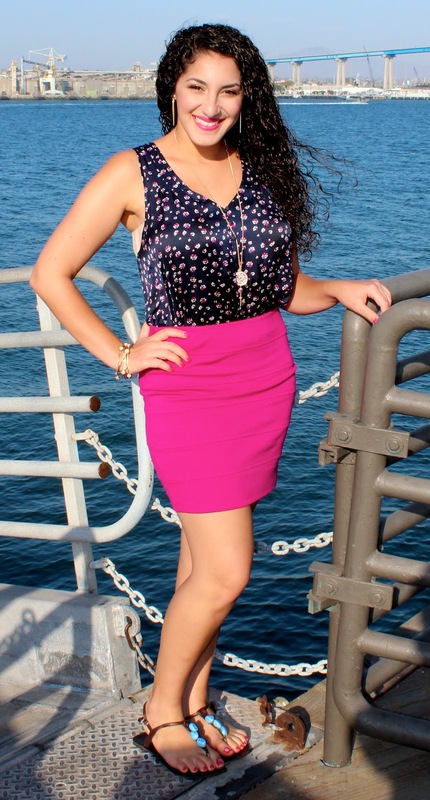 I loved this outfit because I felt the magenta skirt really brought out the purple flower details in the navy blouse. The navy blouse has a thicker T-strap style in the back and is cropped in the front; but I usually end up tucking it into skirts, shorts, and pants. The skirt, blouse, and gold spike earrings are from Forever 21. You can see the Coronado Bay Bridge behind me! I'm wearing my favorite turquoise stone sandals from Charlotte Russe with Essie's Watermelon nail polish on my toes. The key necklace and gold bangles are both from Forever 21. I'm also wearing my new Michael Kors Ryder sunglasses. Lastly, I'm wearing Revlon Colorburst Lip Butter in Lollipop on my lips because I thought it tied in well with the magenta in the outfit!